Background Incident rates of ESRD are much higher among black and Hispanic patients than white patients. Access to nephrology care before progression to ESRD is associated with better clinical outcomes among patients with CKD. However, it is unknown whether black or Hispanic patients with CKD experience lower pre-ESRD nephrology consultation rates compared with their white counterparts, or whether such a disparity contributes to worse outcomes among minorities. Methods We assembled a retrospective cohort of patients with CKD who received care through the Veterans Health Administration from 2003 to 2015, focusing on individuals with incident CKD stage 4 who had an initial eGFR≥60 ml/min per 1.73 m2 followed by two consecutive eGFRs<30 ml/min per 1.73 m2. We repeated analyses among individuals with incident CKD stage 3. Outcomes included nephrology provider referral, nephrology provider visit, progression to CKD stage 5, and mortality. Results We identified 56,767 veterans with CKD stage 4 and 640,704 with CKD stage 3. In both cohorts, rates of nephrology referral and visits were significantly higher among black and Hispanic veterans than among non-Hispanic white veterans. Despite this, both black and Hispanic patients experienced faster progression to CKD stage 5 compared with white patients. Black patients with CKD stage 4 experienced slightly lower mortality than white patients, whereas black patients with CKD stage 3 had a small increased risk of death. 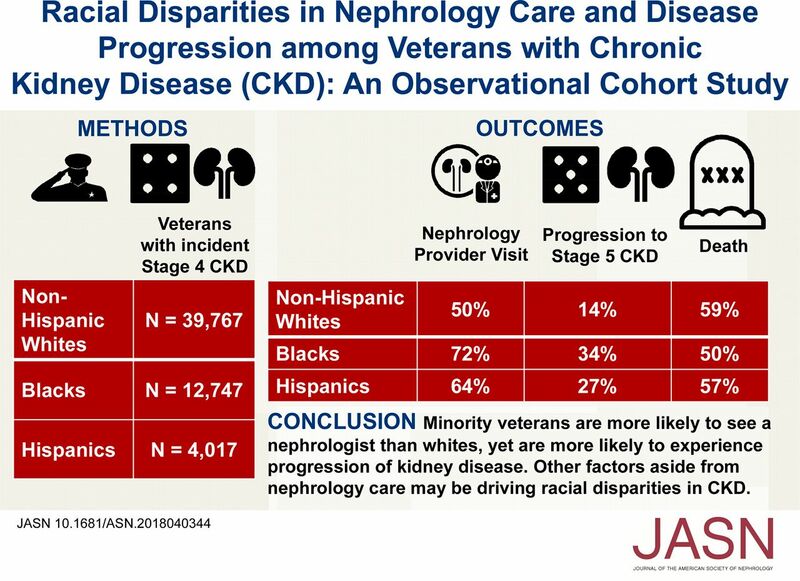 Conclusions Black or Hispanic veterans with CKD are more likely than white patients to see a nephrologist, yet are also more likely to suffer disease progression. Biologic and environmental factors may play a bigger role than nephrology consultation in driving racial disparities in CKD progression.